Earlier this week ICANN's Board Governance Committee (BGC) recommended that the ICANN Board deny a Reconsideration Request from dotgay LLC, in which it objected to emails to authors of letters of support having been sent by an administrator at the Community Priority Evaluation (CPE) provider rather than an evaluator. This will be considered by the full Board at its next meeting. As a reminder, the CPE process was developed by the global ICANN community. It is the responsibility of ICANN to ensure the process is followed. To reiterate, this BGC recommendation is not a statement about the validity of dotgay LLC's application or dotgay LLC's supporters. ICANN supports and encourages diversity and inclusion, both internally within ICANN organization and within our community. During its meetings on 13 January and 1 February 2016, ICANN's Board Governance Committee (BGC) considered a Request for Reconsideration filed by dotgay LLC. This request asked us to reconsider the outcome of a Community Priority Evaluation (CPE), which resulted in dotgay LLC's .GAY application not achieving community priority. Having carefully considered the Request for Reconsideration, the BGC denied it at our face-to-face meeting on 1 February 2016. The information below provides a bit more detail about CPE and Reconsideration, and clarifies what this decision means for the dotgay LLC application, dotgay LLC's supporters and the .GAY TLD. This decision does not mean there will be no .GAY TLD. There are four applicants (including dotgay LLC) vying to operate this TLD. These applicants have the option to resolve the contention among themselves, through channels outside of ICANN processes. If self-resolution cannot be achieved, the four applications for .GAY will be scheduled to participate in an ICANN-facilitated "method of last resort" auction to resolve the contention. Of the four entities applying for the .GAY TLD, dotgay LLC's application was the only community application, and therefore the only application eligible to seek community priority through CPE. If an application achieves community priority, it is then able to move forward towards contracting, and the other applications will no longer proceed. dotgay LLC's .GAY application did not achieve community priority so it continues to compete with the other three applications. I want to make clear that the denial of the Request for Reconsideration is not a statement about the validity of dotgay LLC's application or dotgay LLC's supporters. The decision means that the BGC did not find that the CPE process for dotgay, LLC's .GAY application violated any ICANN policies or procedures. It is ICANN's responsibility to support the community-developed process and provide equitable treatment to all impacted parties. We understand that this outcome will be disappointing to supporters of the dotgay LLC application. We appreciate the amount of interest that this topic has generated within the ICANN community, and we encourage all interested parties to participate in the multistakeholder process to help shape how future application rounds are defined. 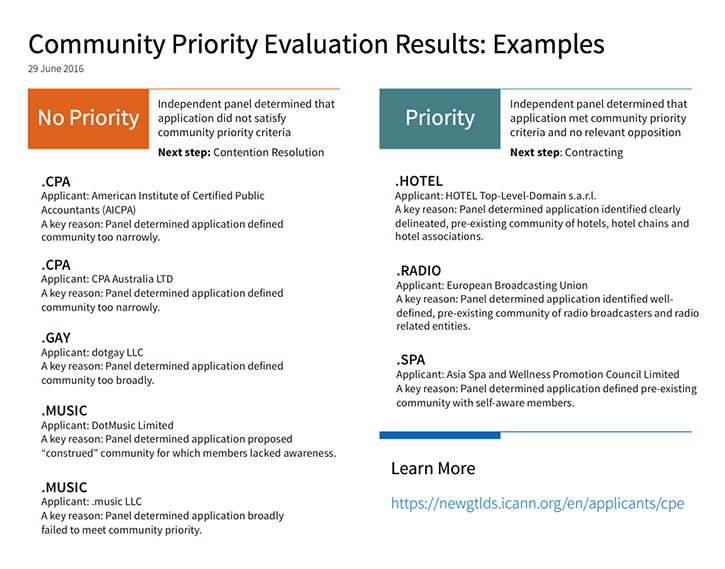 For more information about CPE criteria, please see ICANN's Applicant Guidebook, which serves as basis for how all applications in the New gTLD Program have been evaluated. For more information regarding Requests for Reconsideration please see ICANN's Bylaws.